Today’s post is brought to you by Parks & Recreation, which sadly exited the TV world last week. I’m always sad when such a good show ends its run. My first real brush with TV cancellation was Gilmore Girls. I held a finale viewing party complete with pepperoni pizza and probably Twizzlers in champagne flutes, because that was a thing I was into during high school. Before I get too far into this post I have to admit that I have not watched this season yet. It’s Tuesday airing conflicts with other shows, and I never started catching up, and then due to the not catching up I was something like seven or eight episodes behind when I finally CONSIDERED catching up. Ridiculous. Naturally I read up on the finale, though, because I am the worst at not only reading spoilers but sometimes actively seeking them out, and just the EW recap gave me all the feels. I loved the show for six seasons, and I can’t wait to dive into the seventh over spring break and do all sorts of ugly crying before going back and rewatching my favorite Ben and Leslie moments. These goobers. I love this show for a lot of reasons, but I will forever adore it for bringing the magnificent character of Leslie Knope into our lives. While she certainly has her flaws, she also has a laundry list of positive attributes that I think makes her one of the most relatable, inspirational, and role-model-worthy characters on television. She’s ambitious. She’s caring. She’s loyal. She wears the crap out of a pantsuit. We could do with a few more Leslie Knopes in the world. In honor of this delightful show and its energetic leader I bring you this chocolate bark. Leslie Knope would approve of this because is loaded with sugar and love. I mean it. This was originally a Valentine Day recipe made in tiny heart shaped tins with red and pink sprinkle and M&Ms. Naturally, I couldn’t find any of these, so I went the less festive route. It doesn’t make them any less tasty, though! This chocolate bark has a layer of potato chips in the middle, which lends a nice salty bite. Make this for your next party or just for your yourself! I know I enjoyed more than a few! In a microwave safe bowl, melt the white chocolate. Add the vegetable oil and stir until smooth. 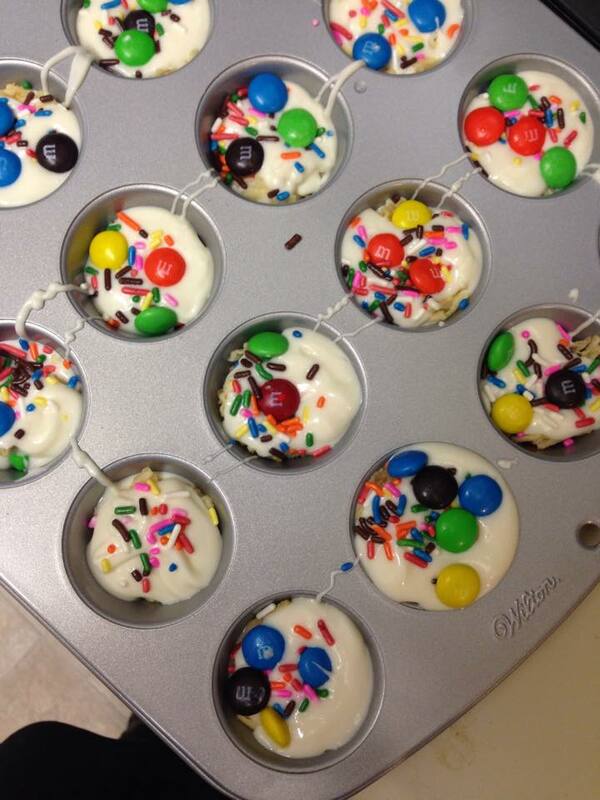 While the chocolate is melting, put a few m&ms and sprinkles in the bottom of each mini cupcake mold. When the chocolate is ready, pour in enough to cover the candy. Add the chips. Fill the rest of the mold with chocolate. Let cool completely and then pop out your candies! Whenever I watch the show I get SO MANY waffle cravings! We just started watching Parks and Rec on Netflix … so addicted! This bark looks awesome! Love that salty bite from the chips! LOVE Lesley Knope. And she would totally approve of this sweet and savory white chocolate bark! I love how easy this bark comes together. I might try it with mini pretzels! Ooh, that sounds delicious!! Let me know how that turns out! Now I”m thinking I should go back and watch Parks + Rec from the beginning! Maybe after I finish rewatching Gilmore Girls…so much to watch and so little time! These little chocolate bark bites are the perfect tv-watching snack. I think it’d be the perfect antidote to having to sit through all of GG S7! I love that show to bits, but that last season…WOOF. I ADORED the Parks & Rec series finale. Sometimes it’s hard to like finales, but they did a really great job, and everything felt wrapped up enough, and happy (happy is the most important part!). Also, potato chips + chocolate is one of the world’s best combos! I can’t wait to watch it! I’m sure I’ll love it and get all overly emotional. I’ve only seen the first season of Parks and Recs, but I really liked it! I need to finish out the show. At the moment I’m rewatching all the Gilmore Girl episodes in order for the first time. I’ve seen most of the later seasons, but not all in order. I’m loving it! It gets even better! I think S3 is where it really hits its stride! I was sad to see it go too! Me too! But, all good things must come to an end! LOVE parks and rec, I’m totally going to miss it too, and this chocolate bar sounds awesome. I am not a parks and rec fan, but my friend’s little sister had a full on party for the finale, with themed snacks and everything! The fans are clearly dedicated for a reason 🙂 Also sweet and salty? YES. Oh wow, that sounds like so much fun! I love themed parties! I love how wild you got with the mixins. Sweet and salty is my downfall, so I’m sure that I would love them. I loved the potato chips in these. I think I actually would have added even more! Like Tip Top Shape on Facebook!! A colorful look into food, fashion and life. There is always reason to celebrate with Confetti. ...but I use them anyway.